Rev. Ralph Peterson has had a lifelong passion for incorporating the arts into his ministry. He speaks with MOCRA Director Terrence Dempsey, SJ, about his role in commissioning the Erol Beker Chapel of the Good Shepherd, designed by artist Louise Nevelson, and located in St. Peter's Lutheran Church in Manhattan. They are also joined by art historian Dr. Jane Daggett Dillenberger, who consulted on the chapel project. Dempsey and Peterson recorded their interview at the studios of WFUV (90.7 FM) at Fordham University in the Bronx, New York, and Dillenberger spoke over telephone from her home in Berkeley, California. Rev. Ralph E. Peterson is Senior Pastor Builder Emeritus of St. Peter’s Lutheran Church in Manhattan. Born in Cambridge, Minnesota, he completed undergraduate studies at the University of Minnesota and a Master’s degree in the Philosophy of Education at Harvard University. Subsequently he studied at the Episcopal Theological School and the Augustana Theological Seminary in Rock Island, Illinois, graduating in 1960. He worked at the National Council of Churches for four years beginning in 1962, where he served as Executive Director of the Department of Ministry, Vocation and Pastoral Services. He became senior pastor of St. Peter’s Lutheran Church in 1966. During his tenure at St. Peter’s, he was instrumental in keeping the church in midtown Manhattan. His shrewd negotiations with National City Bank resulted in a bold new church building located beneath what is now the Citicorp Tower. Under his guidance, St. Peter’s became famous for its embrace of the arts, including weekly jazz masses. Most significantly, he spearheaded the commissioning of the Erol Beker Chapel of the Good Shepherd, designed by artist Louise Nevelson. After leaving St. Peter’s in 1980, Peterson undertook research on health apostolates and became involved with opening congregations for people who were disabled. In 1990 he was received as a priest in the Episcopal Church. Dr. Jane Daggett Dillenberger (1916-2014) was one of the pioneers in the dialogue between modern art and religion. Dr. Dillenberger began her work in the field of art history in 1942. As Professor Emerita in Art and Religion at the Graduate Theological Union, in Berkeley, California, she remained actively involved in the “religion and the arts” program at the Graduate Theological Union until her death. In addition to her teaching, she was a curator and a scholar. Her most important exhibitions were the 1972-73 The Hand and the Spirit: Religious Art in America, 1700-1900, which she co-curated with art historian and museum director Joshua Taylor, and its sequel, Perceptions of the Spirit in 20th Century American Art, which she co-curated with her then-husband, theologian John Dillenberger. Her books include Image and Spirit in Sacred and Secular Art, Style and Content in Christian Art, and The Religious Art of Andy Warhol. Her final book, The Religious Art of Pablo Picasso, co-authored with art historian John Handley, was published in 2014. Dr. Dillenberger recorded this phone interview for MOCRA Voices from her home in Berkeley in June 2012. Lake Wobegon is a fictional Minnesota town populated by memorable characters whose quotidian foibles are recounted by author Garrison Keillor both in print and orally on the public radio program A Prairie Home Companion. Visit the Prairie Home Companion website. Established in 1950, the National Council of Churches (formally the National Council of the Churches of Christ in the USA) is an ecumenical partnership of 37 Christian faith groups in the United States. Its membership comprises a wide spectrum of Protestant, Anglican, Orthodox, Evangelical, historic African American and Living Peace churches. The Council seeks to identify areas of common belief and study areas of division. Its members also cooperate in joint programs of education, advocacy and service. Visit the National Council of Churches website. Robert Warren Spike was born in 1923 and was an American clergyman, theologian, and civil rights leader. As pastor of the Judson Memorial Church on Washington Square in Greenwich Village in the late 1940s he promoted social activism. Among other projects, the basement rooms of Judson House, a student residence on Thompson Street, were made into a gallery where local artists like Claes Oldenburg and Jim Dine had their first one-man shows. In 1963 Spike was appointed the Executive Director of the National Council of Churches’ Commission on Religion and Race. Under his leadership the commission became an important arm of the civil rights movement; as a result, Protestant churches significantly participated in the March on Washington in August 1965. In 1966 Spike became a professor in the Divinity School at the University of Chicago, but shortly thereafter he was murdered, on October 17, 1966. The murder remains unsolved. Learn more on Wikipedia. Joseph A. Sittler (1904-87) was a Lutheran pastor and professor of theology with a long tenure at the Divinity School of the University of Chicago. He served on the Commission on Faith and Order of the World Council of Churches (WCC). He brought together with his theological thought wide-ranging interests including literature, architecture, classical and jazz music, science, ecology, and feminism. He was featured in a 1950s text-decoration: underline;">Life magazine article as one of America’s “Ten Most Influential Theologians.” Explore the Sittler Archives here. Alfred H. Barr, Jr. (1902-81) was an American art historian and the first director of the Museum of Modern Art (MoMA) in New York City. He wielded tremendous influence over the development of popular attitudes toward modern art. Ample resources about Barr, the exhibitions he curated, and his art historical writing can be found online (for instance, in the MoMA archives and in this biographical sketch).From 1954 Barr headed the Commission on Art of the National Council of Churches' Department of Worship and the Arts. In this role, Barr actively sought to define a new aesthetic standard for American Protestantism, one that promoted abstract expression over the representational. This dimension of Barr's work is documented in a number of books and essays, including Icons of American Protestantism: The Art of Warner Sallman, edited by David Morgan, and God in the Gallery (Cultural Exegesis): A Christian Embrace of Modern Art, by Daniel A. Siedell. One of the theologians whose thought Barr promoted was Paul Tillich (1886-1965). Widely regarded as one of the most influential Protestant theologians and existential philosophers of the 20th century, Tillich wrote extensively for both popular and scholarly audiences. Among his key contributions were his method of correlation and his understanding of God as "Ground of Being." Tillich frequently and extensively engaged with the arts in his writings, and in many ways his work forms the theoretical basis of Christian theology's engagement with modern and contemporary art. He was highly critical of what he labeled "kitsch" in religious art, that is, mass produced, "pre-digested," sentimental works that do not engage or reveal what is of "ultimate importance" (i.e., the divine). Tillich's interaction with art was not purely theoretical; for instance, he organized a 1954 exhibition at the Art Institute of Chicago called Masterpieces of Religious Art. See a bird's eye view of the location of St. Peter's Lutheran Church at 54th and Lexington in New York City. Rev. John G. Gensel , honored by Duke Ellington in a 1968 composition titled "The Shepherd Who Watches Over the Night Flock," died at age 80 in 1998. He combined his love of jazz with his pastoral skills, and in 1965 he received special designation as Pastor to the Jazz Community in New York City. He led the jazz ministry at St. Peter's for over 30 years, including weekly Sunday evening jazz vespers. Along the way he counseled jazz musicians and their families, performed marriages, and officiated at funeral services for jazz luminaries including Duke Ellington, Thelonious Monk, Dizzy Gillespie, Miles Davis and John Coltrane. The jazz ministry continues today at St. Peter's. Graham Greene (1904-91) was an English author, playwright, and literary critic, best known for works that explore the ambivalent moral and political challenges of contemporary culture. The Living Room, his first play, debuted in 1953. Read about the critical response to the play in this Guardian article. Read more about Greene in this Wikipedia article. Bernard Pomerance's 1977 critically acclaimed and award-winning play The Elephant Man debuted on Broadway in 1979 but had an Off-Broadway production at the Theatre at Saint Peter's Church earlier that year. Based on the life of Joseph Merrick, a Victorian man whose extremely deformed body made him the object of both curiosity and scorn, the play was notable for the fact that the actor portrays Merrick's deformity through physicality rather than prosthetics (the image at left shows Jay Sullivan in the title role in a 2013 production at the Alley Theatre in Houston) . Learn more about the play here. A movie directed by David Lynch and based on the life of Merrick (but not on Pomerance's play) was released in 1980. Flannery O'Connor (1925-64) was an American author and essayist whose work is marked by a "Southern Gothic style" with regional settings, grotesque characters, and a blend of the comic and tragic. Her writing also reflects her Roman Catholic faith, and frequently examines questions of morality and ethics such as southern racial issues. She suffered from the autoimmune disease lupus and died at the young age of 39. Learn more about O'Connor in this Wikipedia entry. Duke Ellington (1899-1974) and John Coltrane (1926-67) were both pivotal figures in the development of jazz. Both also had notable compositions and recordings expressing the religious and spiritual dimensions, such as Ellington's "Sacred Concerts" and Coltrane's A Love Supreme. Other jazz composers who explored sacred and liturgical themes and structures include Dave Brubeck (1920-2012) and Mary Lou Williams (1910-81). Citicorp Center is among the tallest skyscrapers in New York City. Located at 53rd Street between Lexington Avenue and Third Avenue in midtown Manhattan, the 915-foot high building has 59 floors and a striking stilt-like base. It was designed by architect Hugh Stubbins and structural engineer William LeMessurier. Read a history of the complex on Wikipedia. Here's a LEGO model of the complex. This episode of the podcast 99% Invisible investigates a startling episode in the building's history: the discovery by an undergraduate engineering student that certain types of strong winds could topple the building. Here is St. Peter's (lower left) in relation to the tower (Image by Jeff Goldberg/Esto). 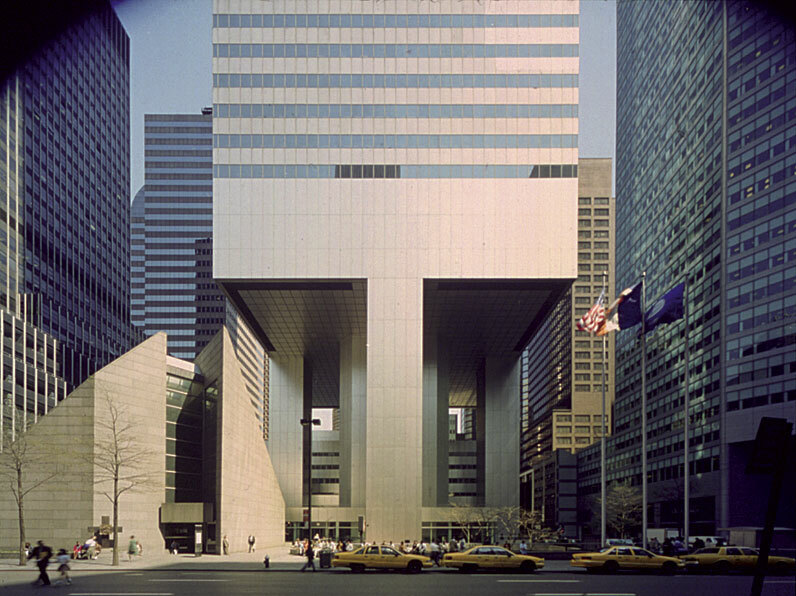 In this image, the overhang of the Citicorp Tower is visible to the right about St. Peter's Church. A view from the interior of St. Peter's looking up to a street-level window. Read more about the architecture of St. Peter's on the church website. Also, the City Guide to Sacred Spaces in New York City has information about St. Peter's, beginning on page 14. For more about Paul Tillich, see above at 3:10. Here are the former plaza entrance to the church, and current entrance. Here are some views of the main worship space. Alberto Giacometti (1901-66), was a Swiss-born sculptor, painter, draughtsman and printmaker. Learn about Giacometti and his 1948 sculpture City Square in this interactive presentation from the MoMA website. Alberto Giacometti, City Square, 1948. Bronze. Collection of MoMA. Louise Nevelson (1899-1988) was born in Czarist Russia but emigrated with her family to the United States in 1905. She attended classes at the Art Students League of New York in the 1930s and by 1941 had her first solo exhibition. She is best known for large puzzle-like sculptural works made of cast-off wood parts (collected from the streets) transformed with monochromatic spray paint. Nevelson cultivated a distinctive public persona that has contributed to her legacy, expressed in dramatic dresses, scarves and large false eyelashes, as well as a sexually liberated lifestyle. Read more about Nevelson in this Wikipedia article, or in this interactive feature from The Jewish Museum. Visit the Louise Nevelson Foundation website here. Louise Nevelson. Photo by Pedro E. Guerrero. Dawn's Wedding Feast was a sculptural installation created by Nevelson for a 1959 exhibition at the Museum of Modern Art titled Sixteen Americans (the other artists included Jasper Johns, Frank Stella, Jay DeFeo, Ellsworth Kelly, and Robert Rauschenberg). The white-painted, abstracted wooden components (including four wedding chapels, a cake, chest, mirror, pillow, several attendants in the form of stationary and hanging columns, and a bride and groom) were dispersed as individual works, but were reassembled for exhibition at The Jewish Museum in New York in 2007, and at the National Museum of Women in the Arts in 2008. Dawn's Wedding Feast was an immediate sensation and advanced Nevelson's career (she was 60 at the time). Read more about the installation and its reconstruction here. Louise Nevelson, Dawn's Wedding Chapel II, 1959. Painted wood. Collection of the Whitney Museum of American Art. Arnold Glimcher is the founder of the Pace Gallery and is considered one of the art world's most powerful dealers. Glimcher has also produced and directed several films, including The Mambo Kings and Just Cause. Read a New York Magazine interview with Glimcher here. See above for a biographical sketch of Jane Daggett Dillenberger . Annalee Newman (1909-2000) was married to Abstract Expressionist painter Barnett Newman . She was an active partner in her husband's artistic endeavors. In the early 1980's she established the Barnett Newman Foundation, which holds his archive and library. Read her New York Times obituary here. Barnett Newmann painted one of the major works of religious-themed art of the twentieth century, his Stations of the Cross. Explore this series of paintings on the National Gallery of Art website. Eloise Spaeth (1902-98) was an art collector, author, and booster of American art. She was active in the American Federation of Art, where she served as traveling exhibitions chairwoman, and was deputy commissioner of the American Pavilion at the 1952 Venice Biennale. She formed a significant art collection with her husband, Otto, who served as vice president of the Whitney Museum of American Art. Of note for this conversation, Spaeth helped review Thomas Merton's manuscript for a proposed book entitled, Art and Worship, although (in part due to her advice) Merton ultimately did not publish the book. Read Eloise Spaeth's New York Times obituary here. Read excerpts from an account of the writing of Art and Worship here. See the discussion about Alfred Barr and Paul Tillich above at 3:10. Louise Nevelson created a sanctuary installation including a bema wall, ark and eternal light for Temple Beth-El in Great Neck, New York. Dedicated in 1970, it is titled The White Flame of The Six Million and serves as a memorial to Jews who suffered and died in the Holocaust. Visit the Temple Beth-El website . Read more about Pelikan on Wikipedia. Peterson makes reference to a number of well-known twentieth-century instances of artists designing sacred spaces. 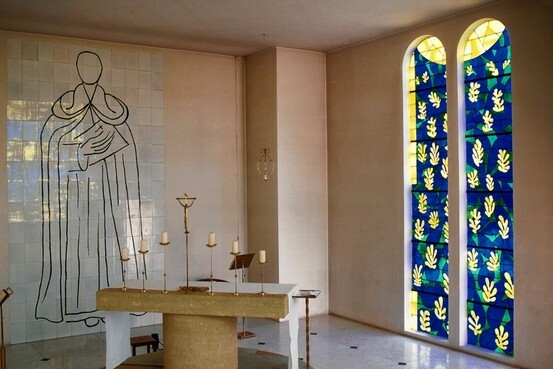 Late in his life, French artist Henri Matisse (1869-1954) designed the Chapelle du Rosaire de Vence (Chapel of the Rosary)--better known as the Matisse Chapel or the Vence Chapel--for Dominican sisters in the town of Vence on the French Riviera. Built and decorated between 1949 and 1951, it houses a number of Matisse originals and was regarded by Matisse himself as his "masterpiece." Read more about the chapel on Wikipedia, or read this ARTnews article about the circumstances of the commission. 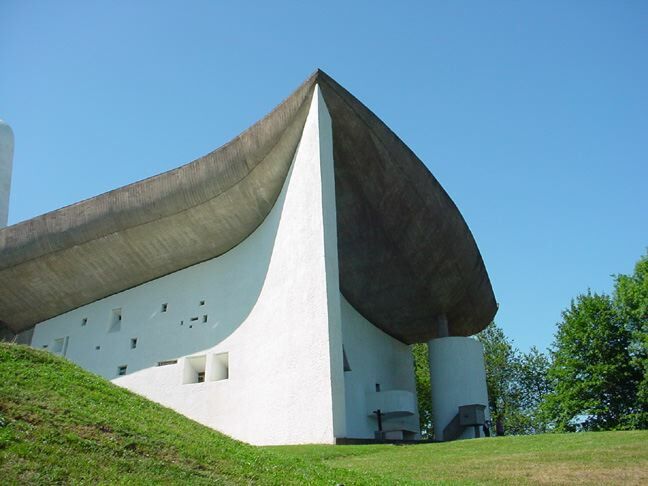 The chapel of Notre Dame du Haut in Ronchamp, designed by Franco-Swiss architect Le Corbusier (1887-1965) was completed in 1954 and is considered one of the most significant and controversial examples of twentieth-century religious architecture. Read an assessment of the chapel on ArchDaily, or explore the chapel through interactive 360-degree photography. In 1964 American artist Mark Rothko (1903-70) was commissioned by art collectors John and Dominique de Menil to create in Houston, Texas, a meditative space filled with his paintings. The resultant Rothko Chapel, with fourteen site-specific paintings, was dedicated in 1971 as an intimate non-denominational sanctuary. A Barnett Newman sculpture titled Broken Obelisk, dedicated to the memory of Dr. Martin Luther King, Jr., stands in the plaza outside. 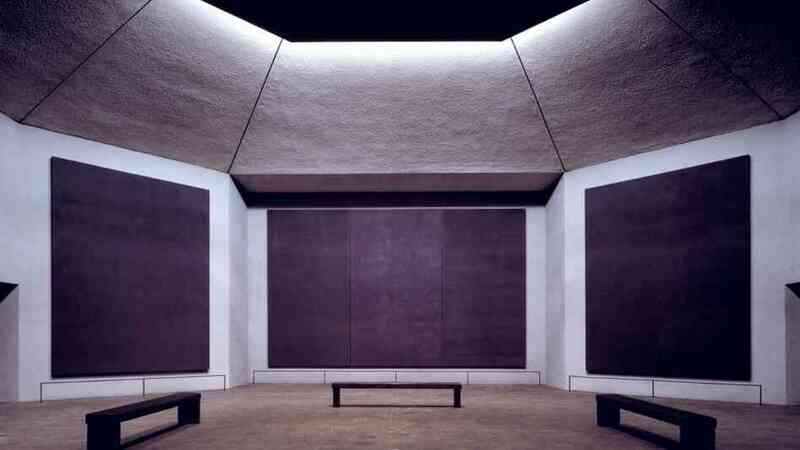 Visit the Rothko Chapel website. The revitalization of New Harmony was achieved in large measure through the efforts of Jane Blaffer Owen (1915-2010). Like her friends the de Menils, she was passionate about contemporary art and connecting it to the religious and spiritual. She befriended Paul Tillich (see above at 3:10), whose ashes are interred in Paul Tillich Park in New Harmony. Read a brief biography of Jane Owen here, and this appreciation of her by MOCRA Director Terrence Demspey, SJ. Following are images of the interior of the Erol Beker Chapel of the Good Shepherd. The view from the entrance facing north, toward the altar. A closer view of the Cross of the Good Shepherd and Trinity (the suspended columns). The view on the left (west): Sky Vestment - Trinity. The view on the right (east): Frieze of the Apostles. The view behind and to the right (southeast corner): Cross of the Resurrection. Looking back toward the entrance (south). A closer view of the Grapes and Wheat lintel. John W. Cook served for 27 years on the faculty of Yale University, where he administered the Religion and Arts Program and taught the history of art and architecture in the area of religious studies. In 1992 he became president of The Henry Luce Foundation, which "seeks to bring important ideas to the center of American life, strengthen international understanding, and foster innovation and leadership in academic, policy, religious and art communities." Read more about the Luce Foundation in this 75th anniversary book. In the sense that Peterson is using the term, an icon is a religious work of art, most commonly a painting, and generally associated with Orthodox Christianity and certain Eastern Catholic churches. Such icons generally depict a holy being or object such as Jesus, Mary, saints, angels, or the cross. Distinctive painting and compositional techniques set icons apart from other depictions of the same subject, including the use of gold leaf or paint as the ground of the painting--landscapes, buildings, and other objects are either absent or highly stylized. Icons function on multiple levels simultaneously, including the communication of essential doctrines of Christianity, and as a point of contact between the mundane world and the realm of the divine. Learn more about the history of icons here and here, and about their theology here. Explore examples of icons here. Louise Nevelson worked with a limited color palette; nearly all of her works through the 1950s were painted black. In the 1960s she began incorporating white and gold into her works. Nevelson said that white was the color that "summoned the early morning and emotional promise," while her gold phase was inspired by the idea being told as a child that America's streets would be "paved with gold", the materialism and hedonism of the color, the sun, and the moon. The Christian doctrine of the Incarnation refers to the belief that God was embodied in the person of Jesus ("incarnate" comes from Latin meaning "in the flesh." While there has been much debate over the centuries about how to understand this doctrine, the most widely-accepted definition of the Incarnation and the nature of Jesus were made at early Church councils in Nicaea (in 325 CE), Ephesus (in 431), and Chalcedon (in 451). Essentially, these councils declared that Jesus was both fully God and fully human; these two natures, divine and human, were united in the one personhood of Jesus Christ. Learn more in this Wikipedia article. John Dillenberger (1918-2008) was a theologian who wrote on historical theology, as well as the relationship between theology and the natural sciences, and between theology and art history. He taught at Harvard, Princeton and Columbia, but was also instrumental in the formation of the Graduate Theological Union (GTU) in Berkeley, California. Dillenberger served as Dean of the GTU from 1963 to 1971, and twice as its President, from 1967 to 1971 and from 1999 to 2000; he held the title of Professor Emeritus of Historical Theology. His books include A Theology of Artistic Sensibilities: The Visual Arts and the Church. Read Dillenberger's obituary in the San Francisco Chronicle. Trinity is another central Christian doctrine: the understanding of God, holding that there is one God in three divine persons, traditionally named the Father, the Son (Jesus Christ), and the Holy Spirit. Each person is God, whole and entire, distinct, but of one "substance, essence or nature" (in this terminology, "nature" is what one is, while "person" is who one is). Learn more on Wikipedia. The Habit of Being is a collection of Flannery O'Connor's letters. Learn more about the book on Amazon. See above at 15:30 for more about O'Connor. The Entertainer is a 1957 play by English playwright John Osborne (1929-94), about Archie Rice, an angry middle-aged music-hall performer with a failing career. The original production starred famed actor Laurence Olivier (1907-89), who also starred in a 1960 movie adaptation. Learn more about The Entertainer here. Read about John Osborne here, and Sir Laurence Olivier here. See above at 47:45 for more about John Dillenberger. Robert Jenson (born 1930) is a Lutheran systematic theologian. He is Professor Emeritus of Religion at St. Olaf College in Northfield, MN, and professor of religion at the Center for Theological Inquiry at Princeton Theological Seminary. He has been active in the field of ecumenical theology (that is, concerning the beliefs and practices of different Christian denominations). Read an article in which Jenson discusses his thoughts on the "loss of narrative" in contemporary Christianity. A chasuble is a poncho-like vestment worn by clergy in some Western Christian traditions (such as the the Roman Catholic, Anglican and Lutheran churches) during liturgical celebrations. Learn more and see examples of the chasuble as it has evolved over time in this Wikipedia article. Dutch American abstract expressionist artist Willem de Kooning (1904-97) was invited in 1984 by the Art and Architecture Review Committee of St. Peter's Lutheran Church to create a triptych (three-paneled altarpiece) for the main sanctuary. It would be displayed temporarily, and if the response from the congregation was positive, a donor would be sought to purchase the work. The resultant Hallelujah triptych (pictured here), as well as the process that led to its creation, provoked controversy and tension within the congregation, and ultimately it was returned to the artist's estate. One of the figures involved in the debate about the work was John Cook (see above at 44:10), who published several articles on the controversy. Read about the incident in this 1986 New York Times article. Learn more about de Kooning through the website for a major retrospective at the Museum of Modern Art in 2011.